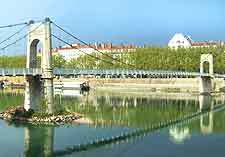 Lyon Saint Exupery Airport (LYS) is located about 24 km / 15 miles from Lyon city centre, on the eastern outskirts. You can access the airport via Junction A432, which skirts Lyon Airport along its eastern perimeter and links both the A42 (to the north) and the A43 (to the south). The airport is close to a number of prominent towns and villages, such as Saint-Bonnet-de-Mure to the south, Pusignan to the north and Meyzieu to the north-west. Also close to Lyon Saint Exupery Airport are Charvieu-Chavagneux, Colombier-Sangnieu, Pont-de-Chéruy and Tignieu-Jameyzieu, all of which lie to the east. The roads accessing the airport may experience traffic delays during the morning and evening rush hours, as well as on popular holidays. Be sure to leave well before your check-in time if you plan on driving to Lyon Saint Exupery Airport during the main peak times.